The very best location and view in town ! Vista Coral studio condo on the marina, boardwalk and beach. 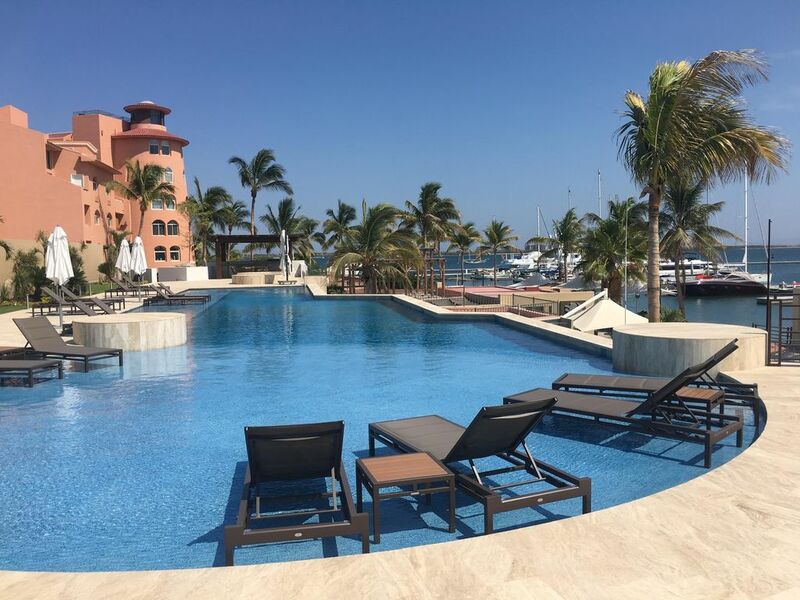 Awesome third story condo with panoramic views of La Paz city, the marina, the boardwalk (Malecon) and beach. Vista Coral is the very best location in town on the boardwalk and the famous restaurants Rancho Viejo, Anzuelos, Chiltepinos and Capri Cafe are only one block away with a taxi stand on the corner. And OXXO convenience store is only two blocks away. You have full access to the condo, swimming pool, hot tubs, BBQ area and all common areas of the property. The Vista Coral condominium has 24 hour security guards and free secure covered parking for your vehicle. The kitchen includes oven, stove top, dishwasher, microwave, kettle, coffee maker, water dispenser with purified water, blender, toaster, pots and pans, wine opener and glasses along with most everything you would need in the kitchen. The condo has air conditioning, a kingsize bed with posturepedic matress, sofa bed, washer and dryer, extra linens and towels, extra pillows, beach towels and beach umbrella, ice cooler, Intercom system, free WIFI internet service and a flat screen Smart TV that includes TERRARIUM TV, NETFLIX, KODI, and MOBDRO with over 5000 free channels and much more. This condo is perfect. Everything you need to enjoy your vacations is provided. Derek is very personable and a super wonderful host and always a phone call away for anything you need . Thank you Derek for your excellent hospitality!!!!!!! Great location and the unit is set up for pleasure. Totally enjoyed myself here at the condo. Pool is warm and well maintained. Perfect for two people and a friend or child. My wife and I totally enjoyed our stay in this amazing condo. Views were great, location the best, and we loved the hot tubs in the rain. Weather did not cooperate at first but we still were able to swim with the whale sharks later Monday. Derek is the most excellent host! First La Paz is wonderful!!! The condo is very nice and clean. Great views and a great location right on the Malecon and very secure. I would highly recommend this place. Also, the host Derek is great! He was very helpful with advice on where to go and what to do. Great guy with a lot of helpful information. Just back from two fantastic weeks at this beautiful La Paz condo. Having been to La Paz several times before, we knew that this would be a perfect location for us, a short walk down the Malecon to downtown and close to a number of excellent restaurants. What a find this amazing condo was for us. Couldn’t have been more perfect. Located in the turret of the Vista Coral complex, the condo offers an unparalleled 180 degree view of the bay, marinas, and the Malecon. The spotlessly clean apartment is extremely well laid out with quality amenities, and very well equipped with everything one needs for a relaxing holiday in La Paz, including a cooler and a beach umbrella for a day at the beach. Derek is a fantastic host. He met us upon arrival and gave us a full tour of the unit as well as many great recommendations for restaurants and local activities. The pool area is exactly as shown in the photos, and was never crowded during our stay. We’ll be back!